Many countries use Electrical/Electronic equipments which operate at 110V but India we use a Standard Voltage of 240V, which is harmful to use. 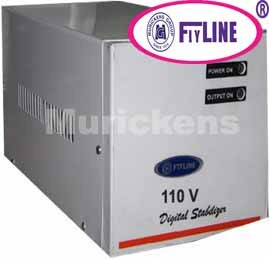 So Muricken's Group have been manufacturing and marketing in Kerala, different capacities of 110V Step Down Transformers with automatic voltage stabilizer with various advanced features. This device is used for the supply of power, in terms of Voltage, for fridges, washing machines, microwave ovens, air conditioners and pressing irons etc.